The specifications of the BJH B20 are (Note that we are not related to K&C Music, Norwood, MA or KC Music, Parkville, MO). This is barely used. Case and harmonica in great shape. Documentation included... this is a thin wax paper insert, which has a few tears. See all photos and let me know if you have any questions before you buy. All sales are final. HOHNER 270 SUPER CHROMONICA. Hohner 270 Super Chromonica Chromatic Harmonica. Hohner harmonicas feature A unique Hohner sound that is a tone benchmark for blues, folk, and rock. Pearwood comb. KEY OF "B". The one, the only, the original -- the harp that was there when harmonica blues was born. Made famous when played by every serious harmonica player from Little Walter to John Lennon, Paul Butterfield to Bruce Springsteen, Neil Young and many, many more. The Suzuki MR-550 is an all-hardwood harmonica; even the covers are rosewood! It gives the harp a rich, dark and bluesy tone that will have your audience begging for more. The richness of this harmonica is unmatched and if you are looking for a traditional sound, here it is! 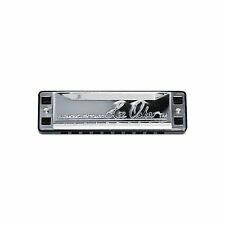 Hohner Golden Melody Harmonica - Authorized USA Dealer - Pick Your Key! 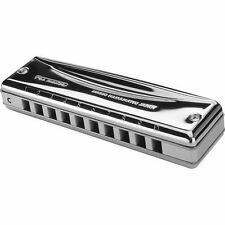 This revolutionary harmonica features precision crafted reed plates for easy note bending and phosphor bronze reeds. The draw cycle valve system circulates air to allow note bending in the blow as well as the draw cycle. 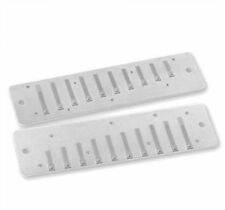 The Solist Pro has the following features Available in 20 different keys or voicings, the Blues SOLOIST is a great go-to harmonica for the discriminating professional. Diatonic harmonica with laser cut body and half-flat stainless steel covers. 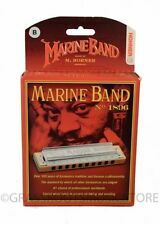 Hohner Crossover Harmonica B - Bolted Assembly & Sealed Bamboo Comb!